Historically, names include Jimmy Wofford, Karen O’Connor, Phyllis Dawson, Tremaine Cooper, Stephen Bradley, Colleen Rutledge, Sharon White, Natalie Hollis, Kim Meir, Steuart Pittman, Danny Warrington, John Williams, Melissa Hunsberger, Kent Allen, Pam Wiedemann, Max Corcoran, Yvonne Lucas, Tom Mansmann, Mike Mendell, Jan Bynny, Steph Kohr and many more who have all volunteered at this Classic 3 Day event! That’s right, these USET riders, former Olympians, World Championship team members and upper level professionals have coached, advised, and assisted at the Waredaca Classic Novice and Training Three-Day Event! Warmly termed the ‘Quarter Star’ and ‘Half Star’, this experience that combines education and competition continues to grow in popularity and support. 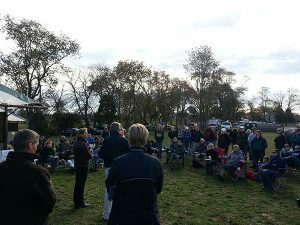 Held at Waredaca Farm in Laytonsville, MD., this ‘one of a kind’ competition is in it’s 12th year at the beautiful family farm and eventing facility in the heart of Maryland’s horse country. A special treat this year will be the return of the very popular international eventing rider Eric Smiley as lead clinician. He is scheduled to assist competitors during the entire event AND offer many educational opportunities for those non participants who volunteer and are interested in the Classic format. All seminars, course walks and talks are open to all entered riders and grooms, support crew, volunteers and so on. And new this year is our partnering with the Area 2 Young Rider Advancement Program- YRAP- expertly managed by Chris Donovan. Growing interest with the Young Riders over the past few years combined with the invaluable horsemanship experience this type of competition requires makes it an excellent fit! Lots of sponsored prizes are given, including a lovely engraved halter honoring the great Brown Betty, an advanced level mare owned by Oliver and Barbara King, which is awarded to the highest scoring mare ridden by an amateur in the competition. The Kings are also providing several special prizes for amateurs that include Rambo coolers as well as gorgeous ribbons for the highest placing amateurs at both the Novice and Training levels! The 2019 Classic Three-Day Event, complete with roads and tracks and steeplechase, takes place over the four days – October 24-27. Food and beverages are provided throughout the experience. Educational seminars and demonstrations include proper horse inspection technique, cross country course walks, steeplechase practice session, conditioning and fitness seminars and more. Volunteers are welcome and encouraged to participate! Novice and Beginner Novice Classic Three-day Events are categorized as Eventing Tests, conducted under the same rules as National Three-Day Events and include a central emphasis on education, including supervised schooling over parts of the steeplechase course prior to the start of the test. BEGINNER NOVICE CLASSIC THREE-DAY EVENT (BN3D)– Open to competitors of any age, on horses four years of age or older. 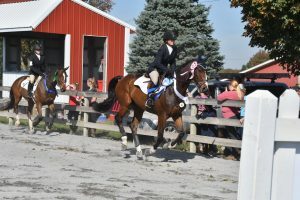 he competitor must complete four USEA recognized beginner novice horse trials or higher. Three must meet the national MERs; one may have no more than 20 jump penalties on cross-country. Two of the qualifying horse trials must be completed as a combination (same horse and rider.) All qualifying competitions must be completed within 24 months of the start of the competition. The final qualifier must be completed within 10 days of the start of cross-country. A competitor established at the Preliminary level may compete on a horse which has obtained 2 MER’s at the Beginner Novice level or higher. NOVICE CLASSIC THREE-DAY EVENT (N3D)– Open to competitors of any age, on horses four years of age or older. he competitor must complete four USEA recognized novice horse trials or higher. Three must meet the national MERs; one may have no more than 20 jump penalties on cross-country. Two of the qualifying horse trials must be completed as a combination (same horse and rider.) All qualifying competitions must be completed within 24 months of the start of the competition. The final qualifier must be completed within 10 days of the start of cross-country. A competitor established at the Preliminary level may compete on a horse which has obtained 2 MER’s at the Novice level or higher. Show Jumping – no more than 16 jump penalties. NATIONAL THREE-DAY EVENTS (P3D and T3D). These competitions are conducted in accordance with the USEF Rules for Eventing and the additions and exceptions noted below. TRAINING THREE-DAY EVENT (T3D) – Open to competitors of any age, on horses 4 years of age or older. Both the competitor and the horse, must have obtained MERs at four horse trials at the Training level or higher. One of which must be attained as a combination. A competitor established at the Preliminary level may compete on a horse which has obtained two MERs at the Training level or higher. PRELIMINARY THREE-DAY EVENT (P3D)– Open to competitors beginning the calendar year of their 14th birthday, on horses 5 years of age or older. Both the competitor and the horse, though not necessarily as a combination, must have obtained an MER at three horse trials at the Preliminary level or higher, plus an additional MER at the Preliminary Level or higher with no more than 20 jumping penalties at obstacles on the cross-country test. A. Riders must be members of the USEA (Junior, Full, Intercollegiate, or Life). B. Horses must be USEA registered: Limited (BN,N & T) or Full (P). C. USEA Fees (Drug/Meds/Admin/Starter) shall be paid at the time of entry. A. Qualifying competitions for all levels must be completed within a 24-month period of the first horse inspection of the selected classic event. B. A horse may be entered in a three-day event without having fulfilled the qualifications. An organizer, at their discretion, and as space allows, may allow entries to fulfill the necessary qualifications after the closing date. EV106 Entries – 2. Entry Forms. Entries must be received by the end of the day on the closing date. Qualifications must be fulfilled at least 10 days before the cross-country test of the competition for which it is needed if the MER has been achieved at a horse trial.